No other plant family provides such a rich and varied palate of leaf forms, textures and colors. Flowers are often delicate and airy with subtle colors and fragrances. 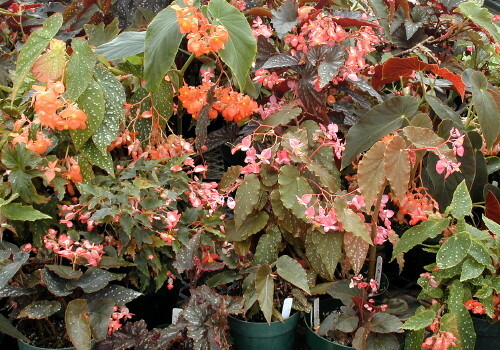 Begonias are adaptable to a wide variety of conditions, from cool and dry to warm and humid. They are excellent subjects for outdoor shade gardens or indoor plant gardens. Family name: Begoniaceae. In addition to our regular listing, Kartuz Greenhouses is pleased to offer a large number of new hybrids from renowned begonia hybridizer, Brad Thompson. Click on the links to the left for each category or follow the "Continue" buttons at the bottom of the page to the next category.